With very little fanfare, Tim Cook (CEO of Apple Incorporated) and Jonathan Ives (Senior Vice President of Industrial design at Apple Incorporated) gathered with a few well-known tech press pundits at the George R. Moscone Elementary Auditorium to announce their latest software breakthrough for their signature mobile tablet, the iPad. A press release was given out for those in attendance along with a code to download the preview for the new iPad-only application. SAN FRANCISCO—April 1, 2012—Apple® today introduced iDVD® for the iPad® completing its suite of iLife® apps for iOS. 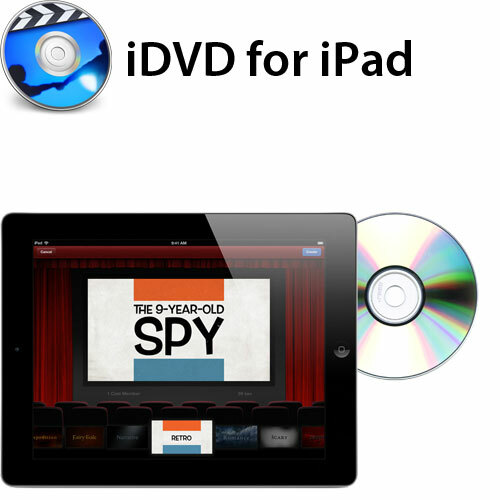 iDVD for the iPade includes breakthrough Multi-Touch™ features so you can use simple gestures to sort through hundreds of movies to enhance and edit (along with the iPad version of iMovie for iOS) your projects using fingertip commands and share stunning optical disks with your friends or save them as completed projects using a virtual DVD drive through iCloud®. iMovie now gives you the ability to create amazing Hollywood-style cinema-tastic like projects ready for exporting into iDVD for the iPad and GarageBand for the iPad allows you to tweak your sound until it’s just right to commit to an optical disk. With the new iPad also featuring a 5 megapixel iSight® camera, you can record, edit and watch 1080p HD video as well as create stunning DVDs all on one device. iDVD for the iPad, Apple’s popular optical disk creation app, has been completely reimagined for iOS to take full advantage of the Retina display and intuitive Multi-Touch gestures on iPad. Simple gestures can be used to select and compare movies side by side and flag your best shots. iDVD for the iPad gives you full control over order, color, contrast, and menu text as you simply touch the parts of the project you want to change. You can enhance your movies by adding beautiful Apple-designed effects with just a tap, or apply adjustments exactly where you want them with fingertip brushes. A series of beautiful and well designed templates are included to get you started or you can just do it all on your own to make a truly unique, one of a kind DVD. In addition to posting DVDs to Facebook, Flickr and Twitter, you can beam completed projects from your iPad; stream them to your Apple TV® with AirPlay®; and use iCloud to publish DVDs to the web and share your stories with friends and family in a whole new way. iDVD for the iPad now allows you to turn the HD video on your iPad into beautiful Hollywood-style optical disk, even as you’re recording. The new Theater view lets you preview and choose from nine templates in a range of genres including Action!, Adventure, and Emo. The templates feature gorgeous, customizable graphics with soundtracks written by legendary composers such as Dweezil Zappa and performed by world class musicians like the Greensboro Symphony Orchestra. You can also share your DVDs to YouTube, Vimeo and Facebook, and use AirPlay to stream them to Apple TV in high definition resolutions up to 1080p. iDVD for the iPad 1.12 will be available on April 31st for $14.99 (US) from the App Store. Updates to iMovie, iPhoto, GarageBand www.itunes.com/appstore).Updates are available today for $9.99 (US) each from the App Store. Updates are available for free to existing customers. 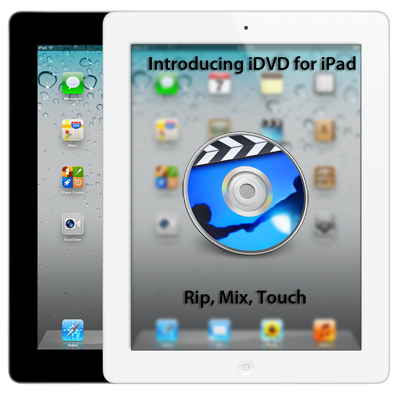 iDVD for the iPad is a universal app that runs on iPad 2 or later. iMovie is a universal app that runs on iPad 2 or later, iPhone 4 or later and iPod touch (4th generation). GarageBand is a universal app that run on iPad (all models), iPhone 3GS or later, and iPod touch (3rd generation) or later. Some features require an iCloud account. Some features may not be available on all products. For more information please visit www.apple.com/ipad/from-the-app-store/apps-by-apple. Apple, the Apple logo, Mac, Mac OS, Macintosh, iPhoto, iPad, iPhone, iMovie, GarageBand, Multi-Touch, iLife, iCloud, Retina, iSight, Apple TV, iWork, iPod touch, Keynote, App Store, Pages and Numbers are trademarks of Apple. Other company and product names may be trademarks of their respective owners.